Saying 'I'm a runner' still feels weird to Ali Mc, but a runner she is! Although she became one quite by accident. This is her story! When Ali and her boyfriend Colin unexpectedly found themselves pregnant there was no question in their mind: they were going to have the baby. So they bought themselves a house and set up home. Their love continued to flourish and they decided to get married. And what better place then Hawaii to do it in! However, Ali Mc had one concern: she was still carrying some extra pounds from her pregnancy. To get bridal beach ready she started working out and watching what she ate. Now, don't start thinking: 'Oh I know júst how this story goes! Ali started running, lost all the weight easily, and was all annoyingly svelte during her wedding day!' Because that's not how it went. Ali hated running, and couldn't stick to any of the running programs out there. When it came to couch or 5K, Ali went for the couch every time. So carry on reading, and find out how Ali eventually díd fall in love with running. Ali: 'I started running in June of 2011. It's weird thinking back to how it all started. I hated running, and only started incorporating it into my weight loss/fitness journey as a pre/post workout routine to warm up and cool down. And I would run on the spot, in front of the tv. I was calorie counting, and if I ate too much I'd start running on the spot while watching Cake Boss or Food Network and time myself. Eventually I got a treadmill and Colin was happy that our rug was being saved. Then somewhere along the line, I started prefering running outside instead of running on the threadmill. That's when I fell in love with running, and the self confidence that came with it. Apart from looking forward to running with her son, Ali prefers to run alone, although she has found that sometimes people can help get her through a run by providing distraction. But unless other people's pace is the same as hers, it can get annoying fast. When it comes to longer distances, she loves running in groups though. Ali prefers to run in the country: she loves trees, and feels like she could run forever in a natural setting. Whereas in the city, she finds it a struggle to continue. For most runs she drives to the trails. This Fall Ali plans to try running on the track for the first time, to do some speedwork. In all the enthusiastic stories about racing, one thing seldom gets mentioned: they cost money! And that is why, though Ali likes participating in races, she can't do too many. So she chooses a few 'special' races. So far she has raced two 5Ks and one 10K, and is currently training for her first half marathon. Ali only reads about running when something pops up, and she needs to find some answers. She tends to favour running blogs, magazines and online resources to books. Which explains why most of the running books she gets from the library go back unfinished. However, there are two books she did like: 3 Months to Your First 5k, and Marathon: The Ultimate Training Guide: Advice, Plans, and Programs for Half and Full Marathons by Hal Hidgon. 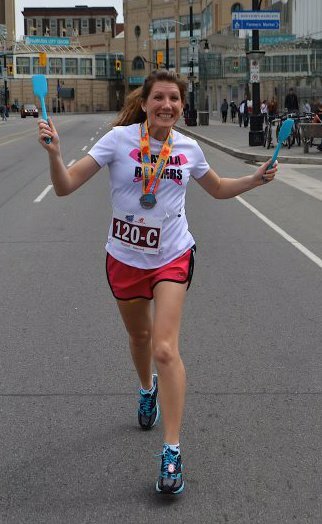 This last title inspired her to plan a full marathon in the fall of 2013. Ali likes her tempo shorts. Running skirts remind her of the skirts she wore as a child growing up in the 80s, and she thinks they look 'funny'. However, since she hasn't tried them, she's reserving judgement. 'Don't knock it till you try it,' is Ali's motto as far as running skirts are concerned. Besides her spatulas ;) Ali uses a Nike+ for a rough estimate on her distances. Otherwise she maps her runs. She has never used a Garmin, but would love to try one. DO IT. When you're a mom, not only is your body different than it used to be, your self-esteem is sometimes lower. Suddenly you're in charge of other beings, and have a whole list of jobs you'd never thought one person could handle - you NEED your own time! Lots of moms start running just to get out of the house and 'live', and I am one of them. Would you like to find out more about Ali? Then visit her blog Running with spatulas!